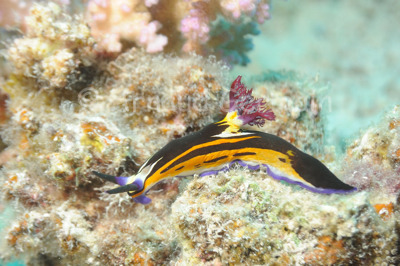 I love nudibranchs, or sea slugs. They come in all sorts of colours and shapes. I managed to dive with another photographer/critter enthusiast. Although I love diving with the big stuff, especially sharks, dives where you look literally under each bit of coral are equally rewarding! I found this nudibranch crawling on some coral, about 15 metres down. We spent about 10 minutes taking pictures. It was first identified in 1990. Thanks to Erwin Koehler for the identification! Marsa Shagra South House Reef, about 15 metres down, Marsa Alam, Egypt.